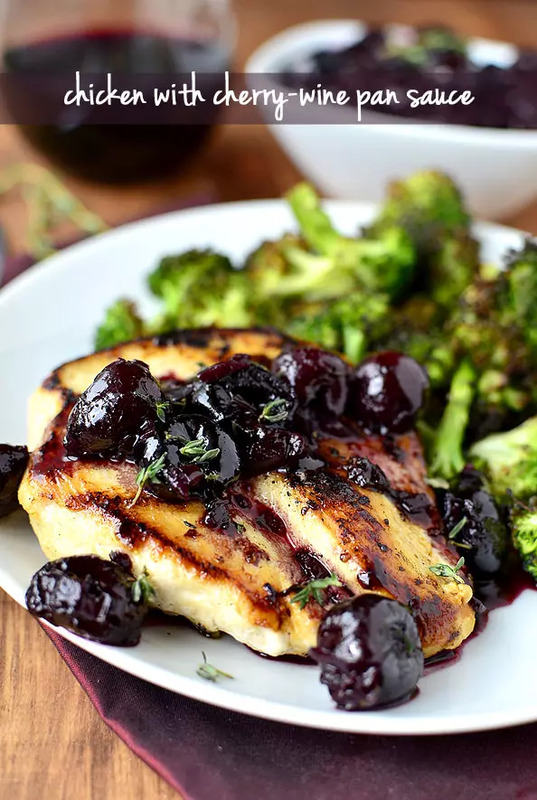 Gluten-free Chicken with Cherry-Wine Pan Sauce is an elegant yet easy 20 minute, gluten-free dinner recipe. Perfect for date night at home, or entertaining! As food bloggers, we start writing about foodie holidays weeks in advance so our readers have time to put together yummy menus for the big day – whatever day that may be. This means, however, that by the time the actual holiday rolls around I’ve pretty much moved on. Case in point, I saw a Valentine’s Day commercial the other day and wondered why the heck it was still airing. Oh yeah, because Valentine’s Day isn’t even until this Friday! Mental note: start thinking about what to get the husband ASAP, as I’ve been politely asked not to get him “boxers with stuff on them” this year, aka his customary Valentine’s Day-themed gift. Sob. 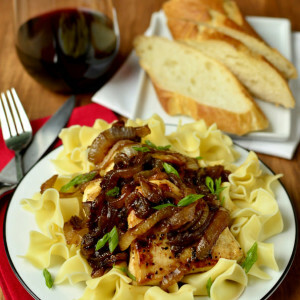 Anyway, I’m sure you’re well aware that the holiday has not passed by yet, so let me toss one more dinner idea your way for Valentine’s Day – Chicken with Cherry-Wine Pan Sauce. 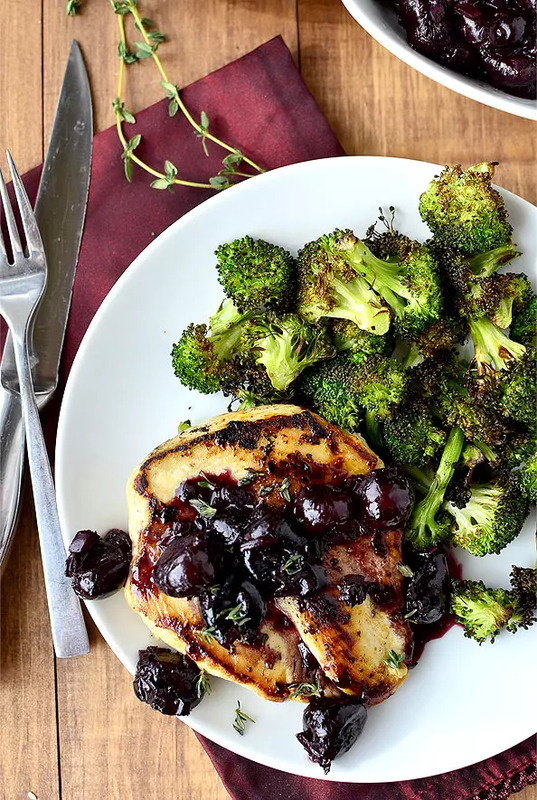 Simply seasoned chicken breasts are seared then smothered in a dreamy, wine-soaked cherry sauce made right in the same skillet. 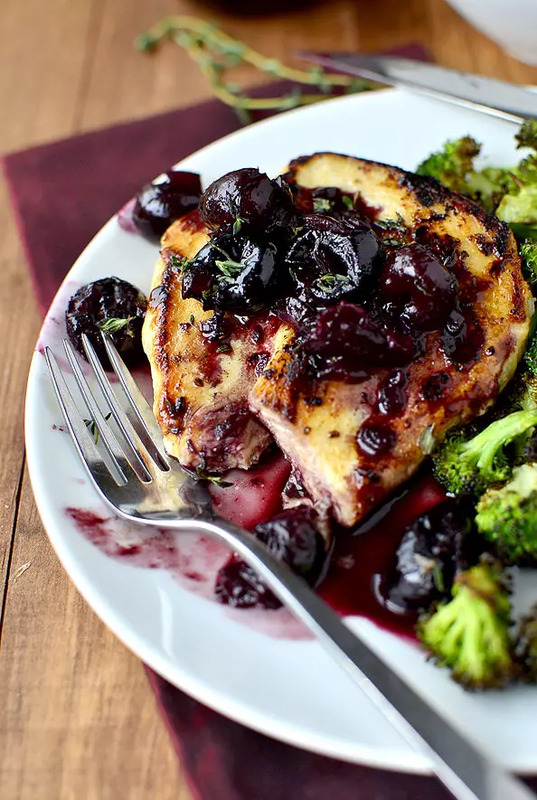 Is there anything more perfect than this dish for the holiday, between the wine and cherries which mimic your heart melting from your loved one?! Umm, right. 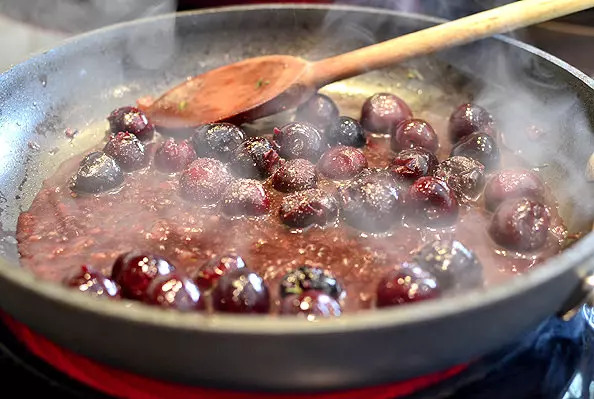 Besides all that, the marriage of frozen sweet cherries and wine with just a wee pat of butter for lusciousness make the most beautiful sauce, and a squeeze of fresh lemon juice at the end brightens the whole thing up. 20 minutes. One skillet. Elegant yet easy enough for everyday. How bad could that be?! Before that though, pound the chicken out to the same thickness so it cooks evenly. Place the chicken on a cutting board then cover with plastic wrap and use a mallet or other heavy flat object (I use a rolling pin) to pound the breasts out to the same thickness. 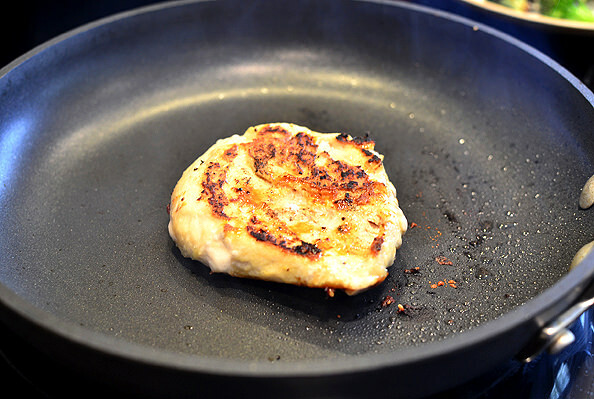 This is CRUCIAL to getting delicious, evenly-cooked chicken! 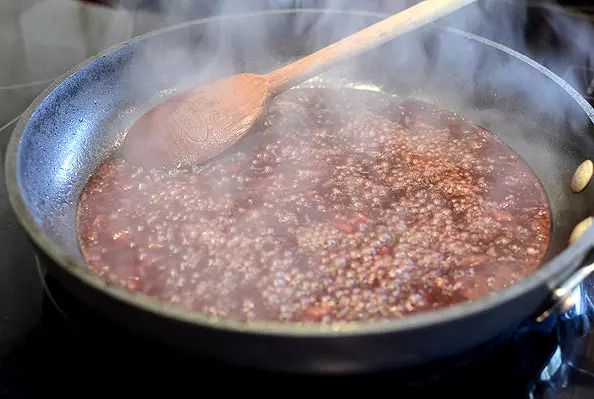 Brush or mist both sides with extra virgin olive oil and season with salt and pepper, then add to the hot skillet and saute for 3-4 minutes a side, or until cooked through. Remove to a plate and tent with foil to keep warm. Next melt 1 Tablespoon butter in the same skillet then add 1 chopped shallot and saute until tender, about 2 minutes. Once the shallots are tender, carefully pour in 1 cup red wine (I used Cabernet,) 1/2 cup chicken broth, and 2 Tablespoons balsamic vinegar. I know some people don’t like balsamic vinegar, but you can’t pick it out in the final dish. It just adds a little something to the sauce. Let the sauce bubble and reduce by about half, 3-4 minutes. 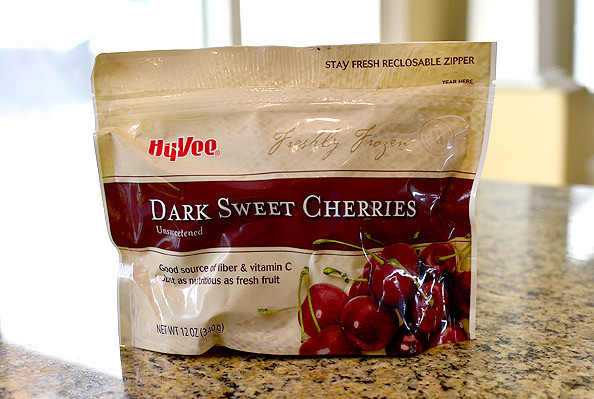 You’ll need 12oz fresh or frozen pitted sweet cherries – no need to thaw them first. Just make sure you don’t get the sour ones. 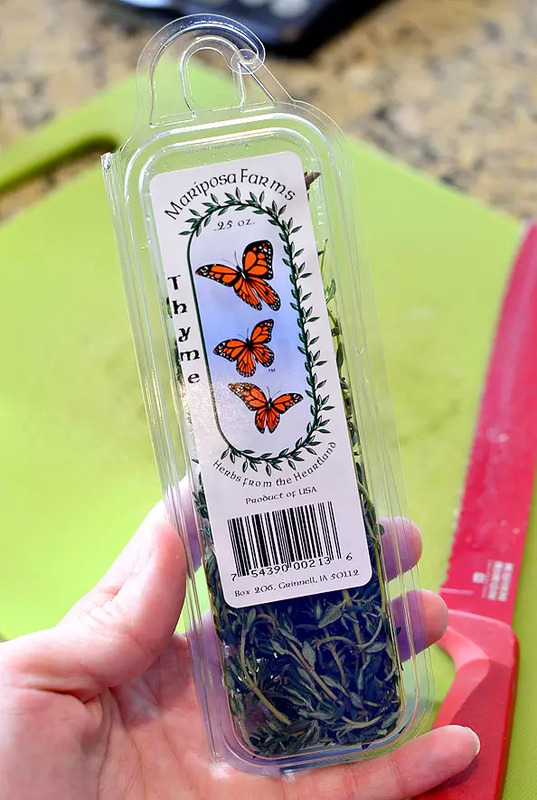 BTW – I almost always hate buying fresh herbs because I use a FRACTION of the container and inevitably forget about them in the fridge until it’s way, way too late. Anyway, check out these mini clamshells I found at the grocery store. They’re the perfect size for just one or two recipes! Continue to reduce the sauce until thickened but still syrupy, 2-3 minutes, then stir in 1 Tablespoon butter and the juice of 1/2 lemon. 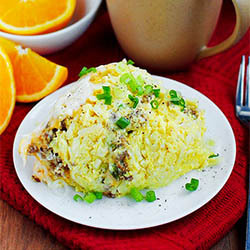 The lemon TOTALLY makes this dish! Plate the chicken then spoon the luscious, ruby-hued sauce over the top. YUM. I served roasted broccoli on the side, which is just fresh broccoli florets tossed with extra virgin olive oil, salt, and pepper then roasted for 10 minutes at 425 minutes. Perfection! 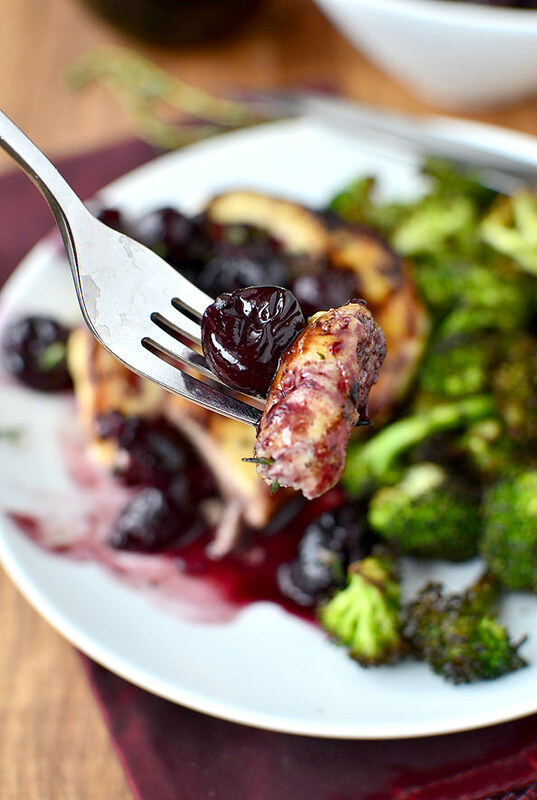 Gluten-free Chicken with Cherry-Wine Pan Sauce is an elegant yet easy 20 minute, one skillet supper! Pound chicken breasts to an even thickness then brush both sides with extra virgin olive oil and season with salt and pepper. Heat a large skillet over medium-high heat (6/10) then add chicken and saute until no longer pink, 3-4 minutes a side. Remove to a plate then tent with foil to keep warm. 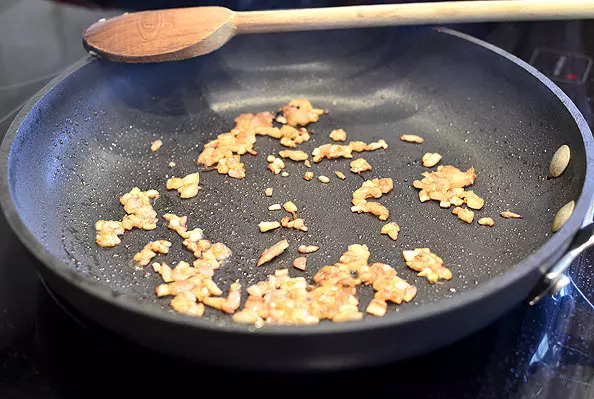 Melt 1 Tablespoon butter in same skillet then add shallots and saute until tender, 2 minutes. 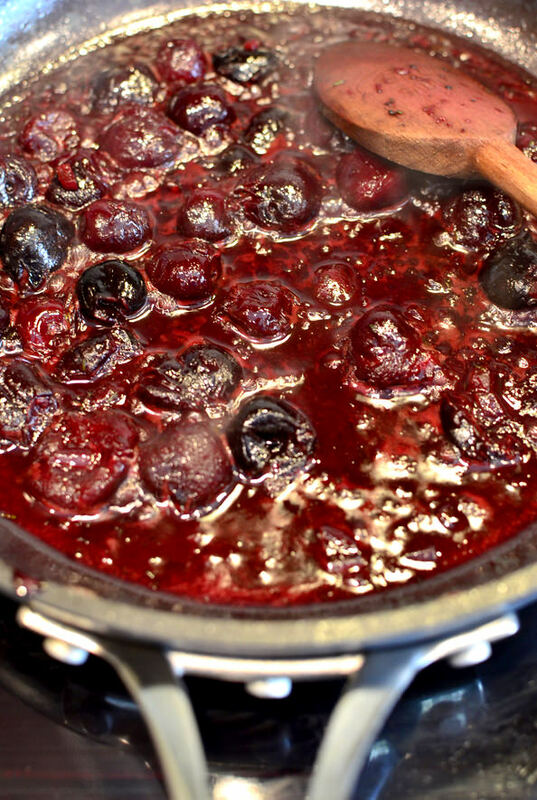 Add wine, chicken broth, balsamic vinegar, and fresh cherries, if using, then simmer until sauce is reduced by nearly half, 3-4 minutes. 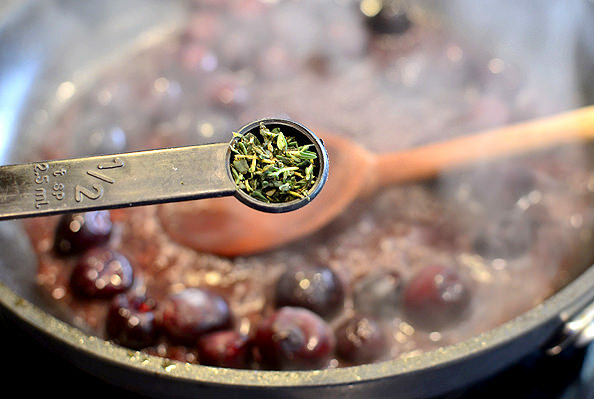 If using frozen cherries, add now with thyme then continue to reduce sauce until slightly thickened, 2-3 minutes, pressing down on cherries gently with the back of a wooden spoon. Remove skillet from heat then stir in remaining Tablespoon butter and lemon juice. Spoon over chicken breasts then serve. Whether you make this dish on Friday or not, you’ll love it. Elegant yet easy enough for everyday. Enjoy! 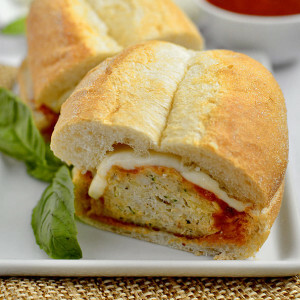 Has anyone tried making this with chicken thighs? My husband jokes that he will divorce me if I ever make boneless skinless breasts again! Or some other protein that would work with this beautiful sauce? Thanks for any feedback. We used thighs and I left the skin on and browned them first as they hadn’t thawed thoroughly and I felt the fat would make the pan hotter. I then removed as much skin and fat as I could, leaving behind the crisp bits. It was delicious. Of course I cooked them much longer than you would thin breast cutlets. I just made this with soft cherries from a cherry-picking trip and it is absolutely fantastic!! This may sound like a silly question, but, I heard that even if you cook the wine, some of the alcohol still remains. Is this true? I’m worried about feeding it to my son. Not silly at all! Some alcohol (about 5%) will remain even after reducing the sauce so I’d definitely take that into consideration! What is the nutritional information for this (yummy) meal? I have a dairy allergy. What can I use in place of butter for the sauce? You can use a vegan butter like Earth Balance. Is there something I could use instead of the wine? I know it’s not much and the alcohol burns off, but I prefer not to use it at all. Hi Christy! You could experiment with a combo of pomegranate juice and chicken broth? I haven’t tried it but sounds like it could be pretty delicious! I made this last night and my husband and I loved it. 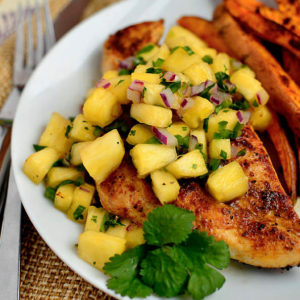 I have always loved the addition of fruit to poultry and fish. Thank you for the recipe! We made this kosher for Passover so didn’t use butter, also I browned skin-on thighs in the pan first. I stuck faithfully to the ingredients and quantities for the sauce and it was absolutely delicious. A definite make again. My 2nd comment about this recipe. My sister and niece came to visit for a week, were wined and dined at restaurants but said this was the best meal they ate here! That is so awesome!! Thanks so much for letting me know, Denise! Great recipe! I modified it slightly by only cooking the chicken 90% of the way through at first, and then finished cooking it in the sauce while the sauce is reducing. That way the chicken soaks up the delicious wine flavor! It turned out amazing! 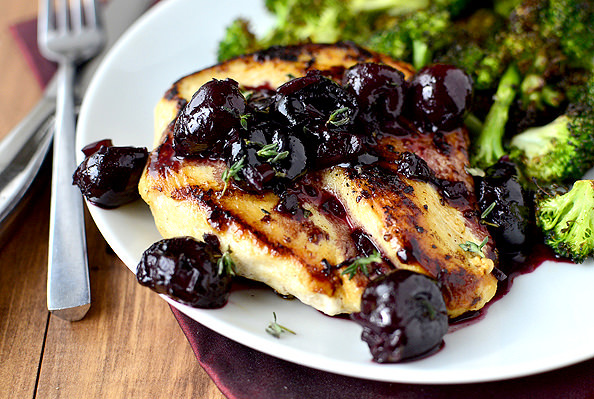 I made this with fresh cherries and it was phenomenal. Made a few tweaks to the recipe but found your video to be so helpful. Thank you for the wonderful meal idea. So glad you loved it, Rio! I bet it was phenomenal with fresh cherries! not sure what happened or if I messed up a measurement but the sauce turned out horrible for me, like inedible horrible! Was way to bitter and I even like balsamic.